Orthodontics is progressing as quickly as every other aspect of dentistry and our Specialist Orthodontist’s choice of appliance is from the ground-breaking 3M Unitek™range. Clarity Advance ™ Ceramic Braces work like metal braces. They are frequently chosen by patients who wish to choose a more cosmetic solution to aligning their teeth because they blend in with your teeth for a great look. They are the perfect combination of strength and beauty, so you can keep smiling during, and after your treatment. Standard braces use tiny elastic bands to hold the wire onto your braces. Advancements in technology now bring self-ligating braces onto the scene. Instead of rubber bands, Self-Ligating Braces use a clip to hold the wire in place, so your teeth may stay cleaner and you can spend less time in your orthodontist’s chair. John and Karen use combinations of both standard and self-ligating braces to make the most efficient combination of appliances individualised for each case. Clarity™ SL Self-Ligating Braces provide all of the benefits of self-ligating braces with the added advantage of translucent ceramic. 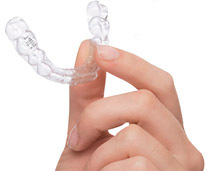 Clarity Braces blend in with your teeth and provide a smooth, comfortable and extremely durable fit. This was John’s choice when he treated himself a couple of years ago! Engineered to move your teeth efficiently. Many adults still have painful memories of the big clunky braces from the past. Luckily, times have changed, and so have metal braces. 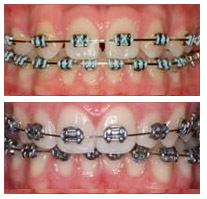 Modern braces are smaller and more comfortable than ever before with low profiles and strong adhesives. At The Priors we use Victory series™ brackets from 3M Unitek. Metal braces with colored bands have become a popular new way to decorate teeth or have silver bands to make them less obvious. In the old days orthodontists used headgear (a cap on the back of the head) to help hold the back teeth steady while they moved the front teeth into the position. We haven’t used headgear for many years now, instead we use small titanium pins called TADs. These are placed comfortably with a small local anaesthetic and help guide more complex tooth movements. They are removed once they have completed their task avoiding the need for headgear. If fixed braces are not your thing then our team are also accredited in the use of clear aligner systems such as Invisalign and Orthocaps . These types of braces have become very popular over the past 10 year reflecting the requests for a maximally aesthetic solution to moving teeth. They use clear plastic retainers which gradually adapt the teeth into their new position. They have limitations in the types of tooth movements and the quality of the end result they can achieve and so are not suitable for every patient.